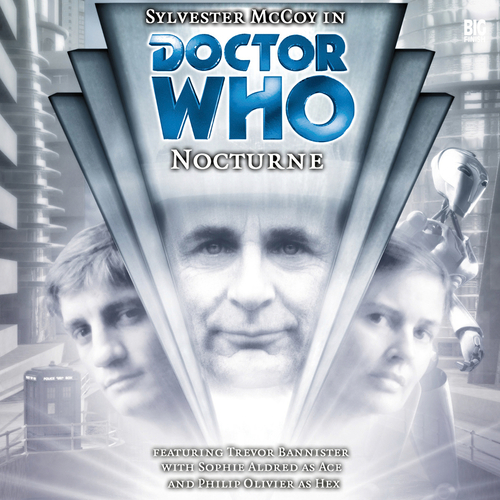 Sylvester McCoy is the Doctor in Nocturne. Nocturne is a story that could have been better with just a little work. The ingredients that make up a good story are present; a unique antagonist, the potential of interesting secondary characters, and a cast member getting a chance for some major characterization. Sadly, only the last one gets any sort of development, leaving Nocturne a barely mediocre story that stood on the precipice of being a solid one, if only for the addition of a few appropriate measures. Veteran writer Dan Abnett (Doctor Who, Warhammer Fantasy, Warhammer 40,000) penned The Harvest, a Cybermen audio that served to introduce Thomas Hector “Hex” Scofield to Big Finish. While The Harvest was a great story, it suffered from what I call “first time audio blues,” where Abnett spent a lot of time having Hex talking to himself and describing his surroundings in great detail. Nocturne doesn’t contain that same flaw, but the engagement and tension that was woven throughout The Harvest fails to appear in this story. Nocturne is a very straight-forward run of the mill story that doesn’t have any true stand out moments. The actions taken by the characters tend to drag out the scenes, while the plot itself becomes repetitive as the story progresses. Characters either repeat themselves or use too many words to get their point across, leading to characters that the listener simply doesn’t become invested in. Near the end of the story, characters seem to take action against their nature solely because the plot demands it. A subplot involving the robotic Familiars as the source of Glasst City’s problems turns out to be a time wasting red herring. And the biggest disappointment with Nocturne lies with its failure to capitalize on the unique nature of the serial’s antagonist, one that was perfectly suited for the audio format. With all its flaws, Nocturne come together as a story that is, put honestly, incredibly dull and really needed a series of rewrites to take full advantage of all it had to offer. With each successive release, it seemed that Big Finish’s writers are getting the hang of writing for the Seventh Doctor. Nocturne is sadly a step backwards for the Seventh Doctor. Sylvester McCoy has the chance to portray a unique side of his Doctor; one who appreciated art to the extent that he actually became close with artists, returning time and time again to Glasst City to meet and socialize with them. The Doctor’s habit of “arrive, raise hell, leave” could have been turned on its ear with this story, but there’s never any true sense of closeness with the artists in McCoy’s performance. The Seventh Doctor could have arrived for an art show in Glasst City and the story wouldn’t have changed much. There’s also a moment at the end of the story where McCoy acts very un-Doctor-like. He vows to kill the creature that’s haunting Glasst City, with little talk about capturing it, or proclaiming that it is just misunderstood. Even though the creature is incredibly deadly…the Seventh Doctor’s eagerness to destroy the creature is incredibly out of nature for him, and it takes away from the story’s climax. The highlight of McCoy’s performance comes during the opening of the fourth episode, as he comforts Ace as she recovers from an attack. The opening of the story has Ace teasing the Doctor about how he brings her and Hex to new and exotic locales but never tells them any important details about the locations OR any of the situations that find themselves in until it’s much too late. The Doctor admits to Ace that he does have a tendency to play his cards close to his chest, but does so out of a need to protect his companions in case he’s wrong. The Doctor promises to be more open in the future, and it will be interesting to see if indeed future Big Finish stories see a more forthcoming Doctor. In any case, it’s a very touching moment of friendship done very well between McCoy and Sophie Aldred. That one scene aside, Sophie Aldred’s performance in Nocturne borders a bit more on melodrama than on drama. For some reason, Ace’s teasing of Hex seems a little more forced and a little less natural. I’m normally an Ace fanboy, but I had a hard time getting into her scenes this time out. Again, it’s a case where Ace’s storyline SHOULD be interesting as she interacts with a soldier returned from the war, Will. 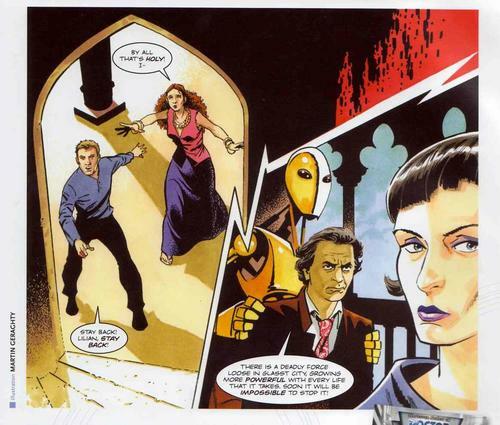 An awkward introduction leads to Will giving Ace a tour of Glasst City as the two of them share stories; Will discussing his brief time in the war and Ace talking about her brother (the third time he’s been mentioned in Big Finish…could this actually be the start of a trend?). For some reason, Ace’s time with Will (played by Paul David-Gough) just doesn’t click. There’s some chemistry between the two actors and characters, but Abnett’s attempt to write a romantic relationship (or a quasi-one) between them falls flat. And it leads to Ace spending most of the fourth episode laid up, save for a violent outburst about Will’s final fate that just doesn’t seemed earned based upon their time together. Hex’s time in Glasst City is defined mainly by being accused by military Overwatch officer Cate Reeney about the murder of a local artist. Hex running into a burning building in an attempt to save a complete stranger is perfectly in line with his character, and Philip Olivier does a fine job as Hex. But Hex really isn’t given very much to do in this story. Aside from his attempt to save someone’s life and his interrogation by Reeney, I honestly can’t remember anything about Hex in this story! I remember more about Reeney, though. Helen Kay’s performance at the military policewoman in charge of Glasst City reminded me 100% about Captain Tanya Oswin in The Nowhere Place. Both women were in positions of power, but came off as complete reactionaries who had no clue how to react the moment things were sideways. Their responses to the situations they found themselves in were those of people who had never been in power before or would have never been put into positions of power in the first place! Reeney was simply the “shouty” speedbump who got in the Doctor’s way solely because the plot demanded the Doctor get sidetracked by someone in authority. And really, there’s no reason to mention the artists that make up the rest of the cast as performances by Trevor Bannister as composer Korbin Thessinger, Eric Potts as poet Lothar Ragpole, and Any Rye as Lillian Dane are completely mundane and fail to truly stand out in any way, save for Lillian suddenly attacking the Doctor in an attempt to save the creature for art’s sake during the story’s climax. Even the normally superb post-production sound work by Steve Foxon feels unfinished. There are many times where the pauses between lines of dialogue go on longer than they should, there are the barest minimum of sound effects throughout the story, and the creature itself doesn’t sound like a raw force of nature so much as it sounds like the Who smashing up their instruments at the end of their set. I did enjoy the classical piece at the end of the third episode, but that’s really about it for the sound work. There’s just so much about Nocturne that is unfinished. The performances by the secondary characters are lackluster save for an almost petulant police officer, Hex doesn’t get anything to do, Ace’s story doesn’t really click, and the Doctor’s moment of admitting one of his major flaws is ruined a few minutes later by his eagerness to destroy the creature. Add to it some weak sound work, normally one of Big Finish’s strong points, and Nocturne is best described as “unfinished.” A little editing, some additional characterization, and a better focus on post-production would have been enough to make this a worthwhile listen, making it hard to recommend this story otherwise. Synopsis – With a lack of interesting characters and little to engage the main characters, Nocturne barely ranks as an unfinished symphony. Next up – It seems the Doctor’s deadliest foes have woven a tangled web indeed. And in order to defeat them, he must cross the forbidden barriers of time and walk into the very centre of their latest, most outlandish scheme of conquest. Peter Davison is the Doctor in…Renaissance of the Daleks. This entry was posted in Big Finish Review and tagged Ace, Big Finish, Big Finish Audio, Big Finish Review, Doctor Who, Doctor Who Audio, Doctor Who Review, Hex, Philip Olivier, Seventh Doctor, Sophie Aldred, Sylvester McCoy. Bookmark the permalink.